Wooden rack of four hooks for keys. Save time and get out the door faster by knowing where your keys are kept. 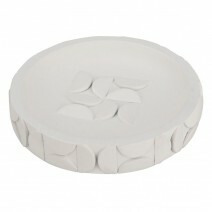 Choice of three attractive colours to suit your décor. 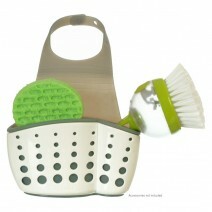 A sensible and attractive addition for your home or office. There's nothing worse than being in a rush to get out the door when just as you're about to leave ... where are the keys?! 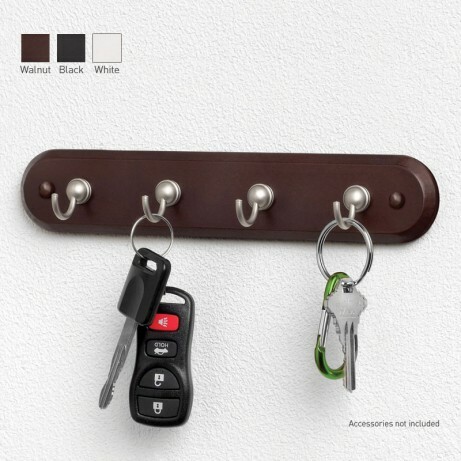 By having your car and house keys kept in a reliable, same spot every day in easy reach, you'll make sure that you get out the door without delay thanks to this 4-Hook Key Rack by Spectrum. Made of timber with four hooks for keys and other light hangable items, this rack is screw-mountable to walls in your home or office (screws not included however screw caps are for an attractive finish). Available in three colours – walnut with satin nickel hooks, black with chrome hooks, and white with chrome hooks – it is a sensible and attractive addition to your home you'll be thankful for every day!